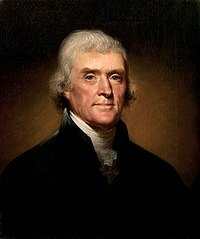 ↑ The birth and death of Thomas Jefferson are given using the Gregorian calendar. However, he was born when Britain and her colonies still used the Julian calendar, so contemporary records (and his tombstone) record his birth as April 2, 1743. The provisions of the Calendar (New Style) Act 1750, implemented in 1752, altered the official British dating method to the Gregorian calendar with the start of the year on January 1 – see the article on Old Style and New Style dates for more details. หน้านี้แก้ไขล่าสุดเมื่อวันที่ 13 เมษายน 2562 เวลา 03:21 น.